As we have been discussing in our Define Your Style series, there is so much more to interior design than just traditional and contemporary. From urban industrial to wabi sabi, the possibilities for self-expression are endless! English country and other traditional design styles are popular with Atlanta homeowners, but there is one take on the look that seems to be especially sought-after these days: updated traditional. Updated traditional interior design is a great choice for those who want to achieve a sense of timeless elegance in their homes, but also want something fresh and new. This type of design is rooted in the past, providing an underlying structure of tradition which is comfortable, welcoming, and classic. However, rather than committing fully to a certain time period or furnishing style, updated traditional spaces embrace eclecticism and a more contemporary attitude toward color, space, pattern, and materials. 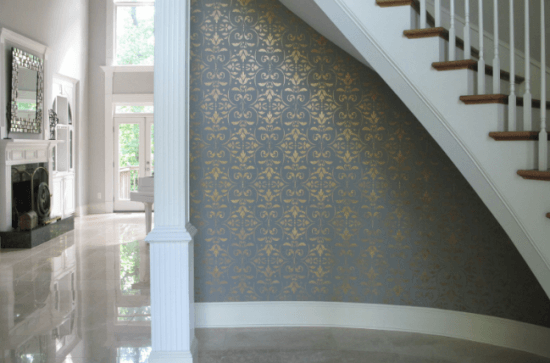 Today’s traditional design uses pattern in a more limited and intentional way, as seen in the subtly glamorous, gold-stenciled foyer above. 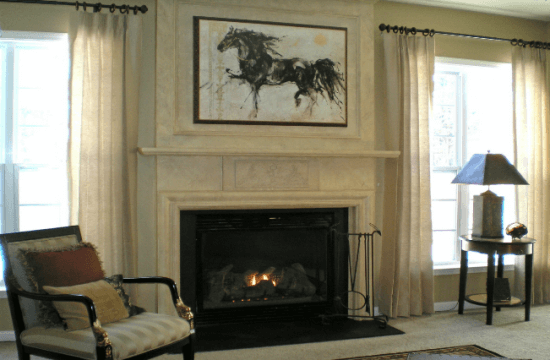 Another hallmark of updated traditional interior design is contrast; for instance, the expressive equine painting above paired with traditional furnishings and architectural features. What do you think of today’s traditional? We’d love to hear from you in the comments below!